It all starts and ends with the cliche of user experience, that drives how a design is conceptualized and reviewed. 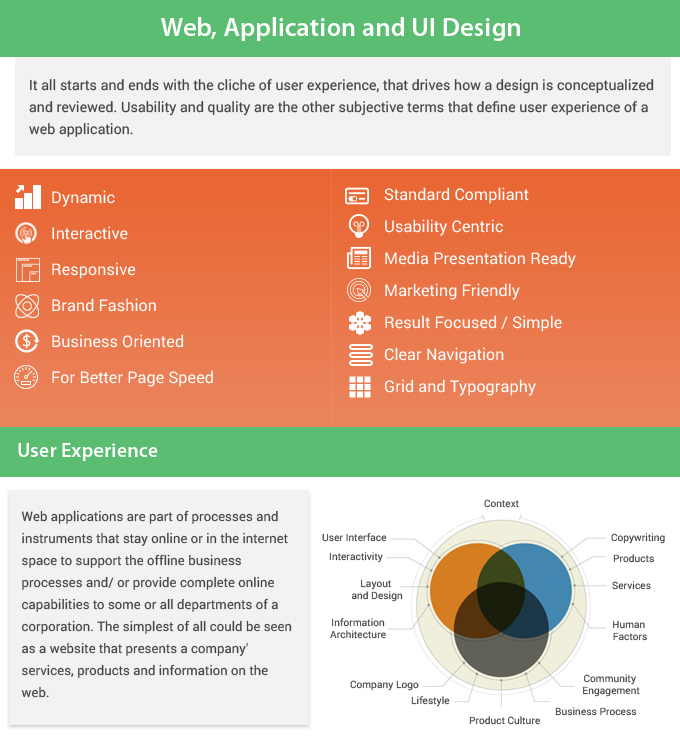 Usability and quality are the other subjective terms that define user experience of a web application. Our Services focus not only on the user experience of display but also the user behavior of the industry to find out what would manage to capture imagination of your user. It is very tough to build an application that surpasses all the user' expectations, and easy for user to ignore the usability of application, if the application has good user experience. But if an application is not usable or the user experience lacks on even part of it, users would complain a lot about the usability, so it becomes a job that is under-appreciated. Trends and recency of design always has a head start while attracting the users, a new design always has that priviledge to be looked at and judged by every user, new trends and modern structures appear every quarter for websites and web applications. With changes in user behaviors and demographics, this becomes a more frequent activity. We work with the latest and most trendy designs and design processes to present not only a new design but also what is most relevant and catchy for your specific industry. What use a design would have if it is not suitable and usable. In recent times website designs and web application designs have been loosing all the clutter and information that once was seen powerful aid to the presentation on web. Websites are becoming sleek and web applications have more steps of smaller strides, all to make it a breezy experience to the users. Smaller forms and faster working or looking applications are the need of the day, since the web users do not come from a desk anymore, they connect from smaller devices and smartphones. Small displays and working from smartphones, we need to be specific about what we show and what we ask users to act on, action calls are becoming more specific and results are more important that the flashy display of information behemoths.